I just want to know if how long would it takes from the HK airport to Disneyland and the time schedule of the train from airport to Disneyland too? Comments for Train schedule from HK airport to Disneyland. Re: Train schedule from HK airport to Disneyland. There is NO direct train from Hong Kong airport to Disneyland. Take the Airport Express Train from Airport station to Tsing Yi Station (it is the next stop station from Airport Station). 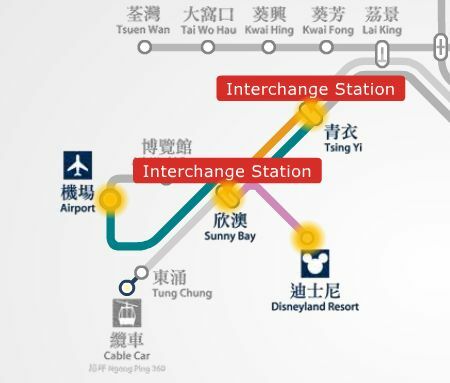 From Tsing Yi MTR Station, take the Tung Chung Line/Disneyland Resort Line trains going towards Tung Chung station and get off at Sunny Bay station. Interchange trains to Disneyland Resort Line going straight to Disneyland station. Total train travel time is only 33 minutes @ HK$ 60 and half fare for children under 11 yrs old when using octopus card (recommended). * Trains will depart from HK airport at 12-minute intervals daily.